An aerial of 'Beacon Towers', the Alva Vanderbilt Belmont estate designed by Hunt & Hunt c. 1917 in Sands Point. Click HERE for more on 'Beacon Towers'. Photo from The Vanderbilt Cup Races. Wow Zach -- great photograph! I read somewhere Alva V. Belmont had the lighthouse shut down; any truth to that? Has the mansion just inland from 'Beacon Towers' been profiled? I don't recognize it. SUPERB View ~ and look at that open countryside !!! What a Great birthday present ~ Thank you, Zach !!! As has been stated, what a fantastic photo and incredible view of Beacon Towers! That pile of towers, peaks and turrets just had to be a mesmerizing sight on the horizon. Doug - I'm going to go out on a limb and say it is this proerty: http://www.zillow.com/homedetails/248-Middle-Neck-Rd-Sands-Point-NY-11050/31077595_zpid/ MyNassauProp has it build in 1908 and the style looks right. House underwent a huge renovation in the early 2000's. Could it be Hazeldean Manor? I don't think the house on zillow is it. 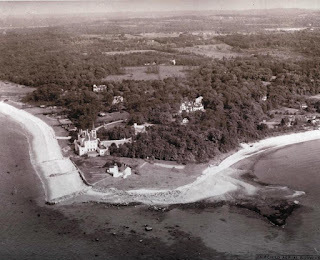 Holy good Earth...Whoof, was Old Long Island gorgeous! I'm with Anon 1:34pm -- thanks. "Most of the big shore places were closed now and there were hardly any lights except the shadowy, moving glow of a ferryboat across the Sound. And as the moon rose higher the inessential houses began to melt away until gradually I became aware of the old island here that flowered once for Dutch sailors’ eyes—a fresh, green breast of the new world. Its vanished trees, the trees that had made way for Gatsby’s house, had once pandered in whispers to the last and greatest of all human dreams; for a transitory enchanted moment man must have held his breath in the presence of this continent, compelled into an æsthetic contemplation he neither understood nor desired, face to face for the last time in history with something commensurate to his capacity for wonder.